Say What? The Hit Series "Real Housewives" are making a 'Real Housewives of Vancouver'! The hit series "The Real Housewives of..." will be coming to VANCOUVER, B.C. Canada! Yes you heard right, The intense drama of the 'Real Housewives' franchise are coming to Canada -- more specifically, to the west coast city of Vancouver. I first heard a little while ago that the show was coming to Toronto.. But after all it looks like the series will launch in British Columbia. According to Shaw Media, the show is set to air on Canada's female-geared reality channel, Slice. It was first announced yesterday at the network’s upfronts (where TV schedules are presented to potential advertisers), the Real Housewives of Vancouver will air on the Slice network likely within the year. I'm so excited to watch it! I have been a fan of the very first of the series which began on Bravo in 2006 "The Real Housewives of Orange County". The episodes follow the lives of usually very rich, ambitious and opinionated women as they live fabulous lives full of private jets, private resorts and private information made public. The shows, which Bravo reports to be the most popular lifestyle programming in the world, are full of glitz, glam and drama as the wives, whether they are in California or Miami they have one thing in common: they aren’t afraid to speak their minds and show their designer claws. It will be fun a show this big in Vancouver! Would you tuning in to watch the 'Real Housewives of Vancouver'? Bravo/Slice & The Real Housewives & Company. Hey Dolls! What are you up to? NHL Playoffs/What's Coming Up.../I Miss My Favorite TV Shows! 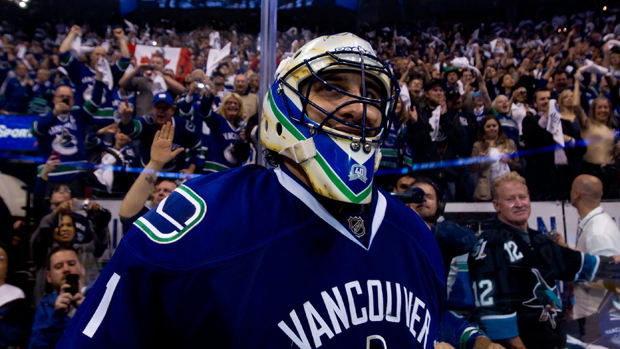 I'm SUPER excited for the CANUCKS VS Bruins 2011 Stanley Cup Playoffs Finals! The games start on this WEDNESDAY! SO close just a couple of days away, from the big events! I will be attending the games & I simply cannot wait!! Make sure you tune into the games on tv if you can't make it to the arena! 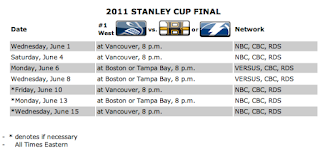 I have posted the NHL 2011 Stanley Cup Playoffs Finals Schedule on a my site so check that here. I have some big exciting posts for you all in the June Month! 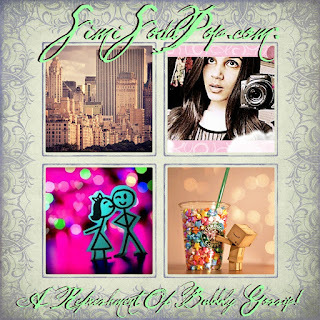 I will be having some lovely singers interviews featured on SimiSodaPop.com & GREAT fashion companies to share with you! Also a couple of my recent Beauty loves! So be on the look out for all those goodies & treats! both 90210 & Hawaii Five-0! 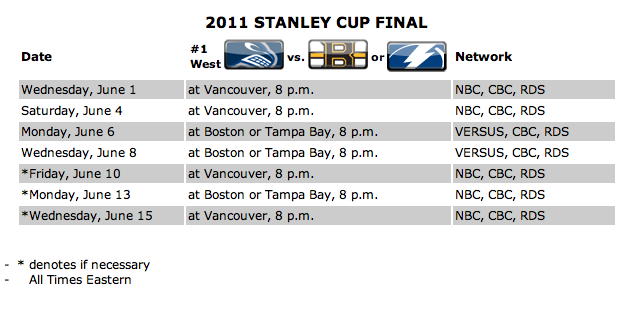 NHL 2011 Stanley Cup Final Schedule RELEASED! Read the dates below! The National Hockey League announced today the 2011 Stanley Cup Final schedule. Based on their NHL-best regular-season performance, the Canucks will host Games 1 and 2 of the Stanley Cup Final, as well as Games 5 and 7, if necessary. Games 3 and 4 will be played in either Boston or Tampa Bay, as well as Game 6, if necessary. I want to wish the VANCOUVER CANUCKS, The BEST OF LUCK! & I say GO CANUCKS GO!! So you know how earlier this year the company "Target" bought the company "Zellers" and they announced that they will be converting or closing the Zellers brand within the next few years. 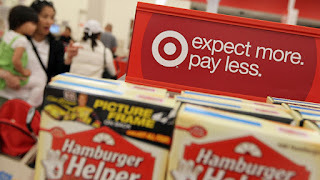 Well today they announced & released a list of the first 105 stores in Canada to be converted to Target. They plan to make 15 TARGET locations in B.C. I'm excited to see that many in B.C.! I was also kind of surprised by the Oakridge location announcement as I have been hearing rumors that the companies "Nordstrom" and "Holt Renfrew" were eying that space. Hmmm, They must have found another location then.. 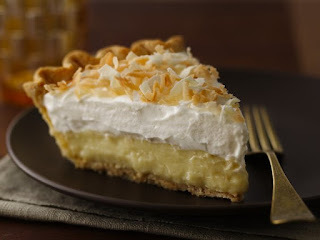 This is a delicious recipe called "Triple-Threat Coconut Cream Pie" I used a egg replacer instead of eggs & it still turned out FABULOUS! Its got a little Vitamin A & Calcium & A Tiny Iron! YAY! Try this version of an all-time favorite coconut pie! It certainly made the grade at a state fair pie competition.